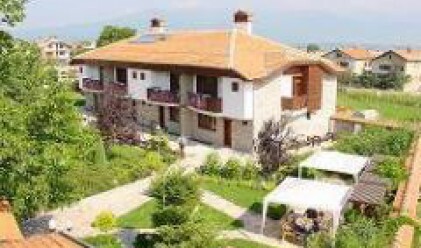 A total of 55 tourist accommodations - family hotels and houses - carry the “Authentic Bulgaria” quality mark. There are three types of quality marks - golden, silver, and bronze - awarded by a team of professional consultants. The certificate is issued for a period of one year. The “Authentic Bulgaria” program is financed by the United States Agency for International Development (USAID), Consortium VEGA/BTD and the tourist branch. Every weekend the team of Profit.bg will publish a presentation of one of the hotels/guest houses carrying the “Authentic Bulgaria” quality mark. Our choice this week is the “Glazne” hotel. “Glazne” hotel - one of the many beautiful places where you can spend the weekend and enjoy all the pleasure it can offer. Where? In the foot of the gorgeous Pirin mountain, in the center of the small mountain town of Bansko, which still preserves the spirit of the Bulgarian National Revival with its cobbled streets, stronghold-houses with high gates, long eaves of black fir, and thick fences bringing a sense of mystery and inapproachability. The four-star hotel has something for everyone- a restaurant, a sky and lobby bar, its own confectionery, tavern and natural garden with a barbecue in the inner courtyard. If you like to swim or you are a fitness fan, you can enjoy the swimming pool and fitness gym in the hotel’s very own sports complex. If you just want to catch a nice tan in the winter or indulge yourself in the pleasure of massage, then don’t forget that the gates of the sauna, solarium, steam shower cabin in “Glazne”s sports complex are wide open for you. The complex also offers different types of massage and cosmetic procedures with original French products. We have to give away a secret: “Glazne” is the proud holder of the “Authentic Bulgaria” quality mark, awarded by Vega BTD. The comforts and recreation devices in the hotel, as well as the interior in the restaurant, tavern and in the fascinating garden are the strong aspects of the overall style of “Glazne” hotel and perfectly fit into the quality criteria of the “Authentic Bulgaria” mark. The luxurious hotel complex comprises 8 apartments, 4 double rooms, 4 double luxury rooms and 7 family villas, each of them with two bedrooms, a living room and a kitchen box, tavern with a fireplace, sauna, garage. Last but not least, if you have decided not just to spend an unforgettable weekend with your better half, but also to throw a big party, the hotel offers a fully equipped conference hall which can seat 60 people and is suitable for seminars, conferences, corporate events, etc. If you wonder just how much you have to pay for this pleasure, you should know that “Glazne” has 3 seasons - high, middle and low and the prices vary depending on the season. If you have decided to indulge yourself between 21 December and 10 March (high season), then be ready to pay between 150 leva for a double room and 335 leva for a family villa. In the mid-season (1-20 December, 11 March - 11 April), the double room costs 130 leva, and the family villa can be yours for 320 leva a night. In the low season (12 April - 30 November) you can throw a party in a double room for 90 leva and in a family villa for 225 leva. Don’t forget the various discounts for your kids.